Art Arfons doesn't feel that he's quite ready to walk on the water yet, but would you believe he's going to try to drive on it, on Firestone tires? You drag fans will recognize Cyclops as his old jet drag-car. Art has attached a pair of 26-foot-long aluminum pontoons, each 3-feet-wide and containing a 20-gallon fuel tank, with the balance of the space being filled with polyurethane foam. Together, the pontoons are rated as capable of supporting 18,000 pounds. Beam was held to 8 feet to permit towing on a standard flat-bed trailer. 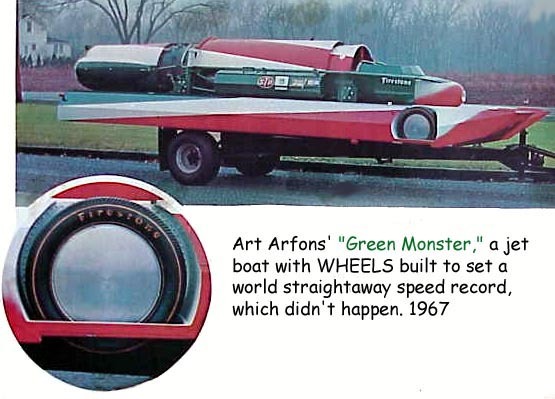 This hybrid boat/car combination has been named Green Monster. The whole idea of rolling over water begins to sound a lot more practical if you think back to just how solid the water was when you fell off your water skis at anything over 60 mph. That water gets pretty hard at high speed. Art is relying on this fact to allow him to roll over the surface at speeds above 150 mph. The water's surface becomes as hard as concrete at these speeds, so Art has a pair of Firestone 8.00 x 15 racing slicks mounted in wheel wells just aft of the forward tips of the pontoons. The wheels are mounted on a pair of '55 Packard spindles and project 3½ inches below the bottom of the pontoons. With about 50 psi of air in the tires, the jet boat (?) should be able to ride up onto the surface of the water with the wheels, and at high speed ride on a three-point suspension consisting of the two front tires and the 1½-inch-thick Timken steel rudder at the rear. To prevent becoming airborne, Art is relying on his old standby — a stubby fixed wing over the cockpit. The wing will be about 4-feet-long and 3-feet-wide and will be adjusted as necessary during the trial runs. The Monster mounts an 8000-pound thrust J-47 engine for power, and braking will be accomplished with two drag chutes. The car has turned 248 mph in the quarter, and 342.88 mph on the salt, indicating there will be plenty of pressure to get the job done. Total weight is expected to be about 7000 pounds. This is pretty heavy for a high-speed boat and would normally require quite a bit of distance to get "on step" and up to speed, but ever-resourceful Art has another gimmick up his sleeve to solve his problem. The sponsons each have a 3-inch-deep inverted V-bottom that creates a channel beneath the sponson for its entire length. Art intends to pressurize this space under the pontoon with about 80 pounds of compressed air, bled directly from the jet engine's 12th compressor. At rest, the waterborne Green Monster has a 9-inch draft. Fuel capacity is 80 gallons with 20 each in the sponsons and 20 in each side-mounted tank. Color is Art's own wild green, red and white. That cockpit should be quite familiar to Art by now. But the water trip will be an all-new experience. Note how the car wheel hub is bolted to the sponson. [text missing?] stage. This air cushion, he hopes, will give him added lift and get the big pontoons out of the water quickly with a short burst from the afterburner. By about 90 to 100 mph, she should be on the steps, which are 4 inches ahead of the wheel wells. When he reaches 150 mph, she should be completely out of the water and riding on only the wheels and rudder. From this point on, the sky is the limit. The wheels and their rolling effect will be less sensitive to ripples and less apt to bounce the hull off the water. Test runs will be made this summer on Michigan's Hubbard Lake, and if things look good, the top speed runs are planned for Lake Mead in mid-summer. An eight-foot beam permits towing on a standard-width trailer. A stubby wing will be mounted over the cockpit to keep her "glued in" when speeds reach 300.